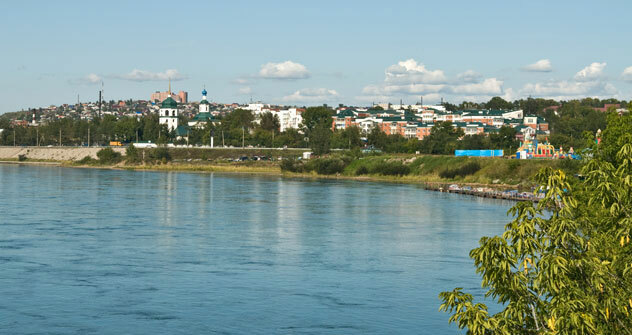 Many travelers visit Irkutsk on their way from the Trans-Siberian to Lake Baikal, but the city has some charms all its own. On our journey along the Trans-Siberian, my friend Juliet and I stopped in Irkutsk primarily as it is the gateway to Lake Baikal. We arrived at the Irkutsk train station t at almost six in the morning and since the buses to Baikal do not leave this early, we ensconced ourselves in a café next to the station to wait. Although there was no line at the counter, Juliet stood there 10 minutes to order a cup of coffee. After she returned to watch our bags, it was my turn to get a jolt of caffeine. Upon ordering a white coffee, the waitress simply turned to me and rapped out a sharp ‘Nyet!’ Somewhat confused (I was, after all ordering coffee in a café – not the most unusual of requests) I repeated my order, only to receive the same response. Determined to succeed, I asked what was wrong and was told that the cash register was not working. I am normally a very reasonable person; I am polite (I am British, after all; it is bred into us) and I do not get annoyed easily. I have also put up with more than my fair share of Russian rudeness so at 6am on a wet, drizzly morning in a café near the Irkutsk station, I cracked. Turning back to the woman, who looked mildly surprised, I asked, rather desperately, one last time for a coffee. The waitress stomped over to the coffee machine, filled up a cup and then slammed it down on the counter. Coffee sloshing everywhere, I banged down my rubles and sat down, rather disgruntled. This was my welcome to Irkutsk. Despite this rather unpleasant welcome, Irkutsk is actually quite a nice place to be. The city still feels part gold-rush town, part 1960s Soviet Union. In the 1880s, the prospect of gold in the Lena River brought people here to seek their fortunes. Big buildings went up, but the town now feels like it could do with a coat of paint as battered wooden houses sit near new shopping malls. Some of the best wooden houses can be found on Dekabrskikh Sobyty Street near Timiryazeva Street. Although several of the houses look like they are about to fall down, it is nonetheless to Irkutsk’s credit that they are still standing (complete with blue paint). Like the city of Yekaterinburg, Irkutsk has done a much better job of preserving these traditional wooden houses than some other towns. Somewhat understandably, houses like these are all gone from Moscow and St Petersburg so for the traveler who ventures outside the two capitals, it is interesting to see what pre-revolution Russian life might have been like. Wandering down Karl Marx Street, it is also possible to admire the more recent grand 19th century brick buildings, which are reminiscent of those found in St Petersburg. Irkutsk’s sights are not confined to one place but are spread around the city, which requires visitors to hop on a trolleybus. At a cost of about $0.45, this ride is both a cultural experience and a very economical way of getting across the city. Worth a visit is the Volkonsky House Museum. Count Sergei Volkonsky was shipped off to Siberia as punishment for his role in the Decembrist uprising, and his home in Irkutsk has now been preserved for posterity. The house is surrounded by a courtyard that contains all the trappings needed by a count in exile, including stables and servants quarters. Inside there is an interesting exhibition dedicated to the wives of the revolutionaries (including Maria Volkonskaya) who stoically followed their husbands into exile across Russia having scraped together the money for the train fare. Fast forward 100 years and you could equally be in the Soviet Union. Battered apartment blocks and concrete buildings evoke Soviet Russia. There is, of course, a Lenin statue or two and the main street is named after Karl Marx. Some of the avenues are lined with trees, and on a summer’s afternoon it is possible to see elderly couples taking a stroll. You find yourself almost listening for Soviet music to begin drifting though the trees. Equally Soviet is the outside market where old ladies sit selling bunches of herbs likely grown in gardens. Ever-abundant are the Russian herbs of choice dill, parsley and coriander without which no meal is complete. This market is an ideal pit-stop place for those who are about to journey on – either to Baikal by road or to Mongolia by train. On sale, depending on the season, are fresh raspberries, peppers and cucumbers. Nearby the outside market is a covered building housing meat, cheese and bread stalls. The meat may look a little iffy – especially as it is apparently left out all day unrefrigerated – but some of the cheeses are quite good and are a welcome snack when paired with bread or crackers on those long Siberian journeys. For something a little more filling and for those with more time, Irkutsk has a wholly unexpected yet entirely welcome offering: an Indian vegetarian restaurant. Café Govinda can be found on 4 Fure Street and offers all manner of traditional Indian foods from samosas to desserts. Very reasonably priced, Juliet and I sampled our way though deliciously cooked potato, broccoli and carrot dishes and finished with herbal tea. The staff are also quite happy for customers to linger over their food as they wait for a train and to advise on dishes and more unfamiliar desserts. Coming towards the end of our Trans-Siberian journey, Juliet and I sadly left Café Govinda and made our way to the Irkutsk airport. Having heard horror stories about the airport and runway, we were delighted to find that a brand new terminal complete with 24-hour coffee shop has recently been built. Boarding our flight back to Moscow after travelling more than 6,000 miles on the Trans-Siberian railroad, I reflected on how diverse this country is. The best way to discover it is to just get out of Moscow and explore.